By Costa Maragos Posted: January 12, 2018 3:00 p.m.
There’s something about discovering old family photos that touches an emotional chord. So it was for visual arts student Jim Hall, when he came across his old camera containing an undeveloped film. It turns out the photos were taken 17 years ago. Hall’s photo discovery of his son, now 34, brought back a flood of memories and got him thinking about his love for photography. Hall, 71, is now back in class and enrolled in visual arts classes in the Faculty of Media, Art, and Performance. He’s taking three classes this winter semester including a black and white 35 mm film class and a photojournalism class. His photos are getting attention. 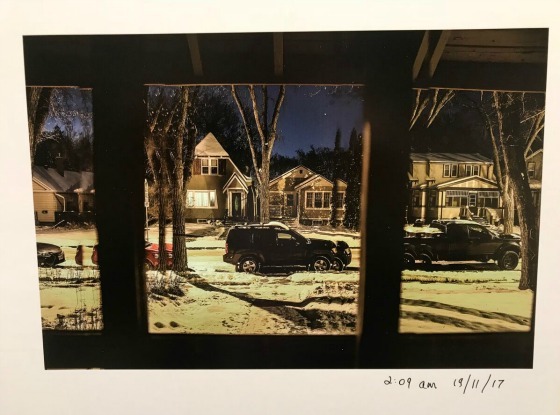 Samples of his work are now on display at the Archway Gallery as part of the Archer Library’s latest student art exhibit. A show reception takes place Tuesday, January 16 at 2:00 p.m.
“It feels great to have the work on display. It’s been wonderful working with the students. I’ve learned a lot from them,” says Hall. Hall earned a Bachelor of Education at the University of Regina and his law degree at the University of Saskatchewan in 1979. He worked in private practice through most of the 1980’s before moving on to government where he completed his distinguished legal career as Senior Crown Counsel, Legislative Services with the Ministry of Justice and Attorney General of Saskatchewan. His free time includes volunteering at the Regina Free Legal Clinic. Hall tried keeping busy. He took some weekend photography classes, which rekindled his love of taking photos. One of the photos by Jim Hall on display at the Archway Exhibition Space. So he turned to the U of R. A Black and White Photography class caught his eye, which also reminded him of an old 35 mm film camera he purchased in 1975. “I remember having this camera so I rooted around my house. I have a big old house with lots of rooms,” says Hall. As it turns out, he not only found the camera - but also discovered a cardboard box filled with negatives and contact sheets. Memories that got Hall thinking of the future and a return to university classes. “It’s a great place. The U of R has changed over the years,” says Hall. He enjoys connecting with younger students. “It’s really exciting to see the contrast of work. Just being in class and sharing ideas and then the critiques. The critiques are very helpful,” he says. Now Hall is creating new memories through his photography, whether it’s digital or the use of his vintage camera. He encourages others in his position to think about university. Hall has another piece of concrete advice for those who have been out of school for a number of years. “Get a paper catalogue. You can look through it, mark it, fold a page and then talk to the admissions department,” says Hall. Slowly, Hall is building his credits, but has no plans to get his degree - although that remains a possibility. “I’m just having a lot of fun right now,” he says. 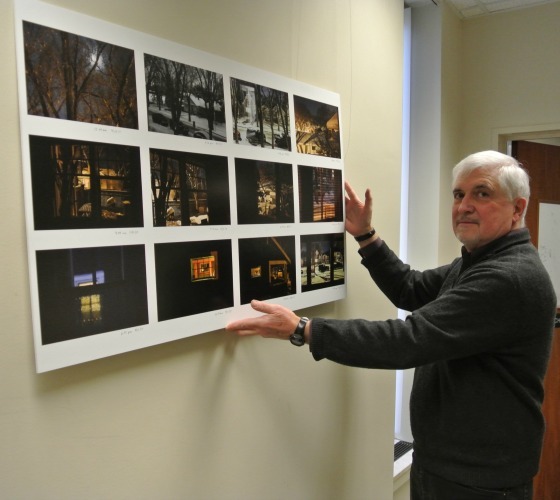 You’re welcome to meet Jim Hall and the other student photographers at the Archway Exhibition Space, Tuesday, January 16 at 2:00 p.m. The gallery is located on the main floor of the Dr. Archer Library. The photos will remain on display until April 25. Please visit here for more information on the students’ exhibit. Are you interested in returning to University? Our team at the Registrar’s Office is happy to help you. Please visit here for more information.